The world’s biggest mango certified by Guinness Book of World Records is owned by Filipino couples. The world’s biggest mango is presently found in the Philippines. Specifically in Tubod, Iligan City which is in Northern Mindanao, the southern part of the Philippines. The biggest mango weighs 3.5 kilograms which surpassed the 2.4-kilogram mango from Canada. It is now in the Guinness Book of World Records which holds a title of being the “World’s Biggest Mango”. It has a length of 30 centimeters and a diameter of 50 centimeters. The variety of this huge mango is known as “Florida Keith”. 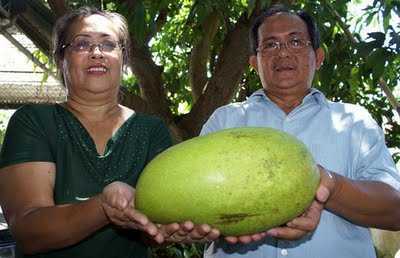 Filipino couples Mr. and Mrs. Bodiongan of Iligan City own the 3.5 kg mango. This entry of being the World’s Biggest Mango was certified by Guinness Book of World Records. Department of Agriculture (DAR) in Northern Mindanao and the Guinness Book of World Records awarded the family some cash incentive. The gigantic mango was being displayed in the “Sundayag” activity of the DAR Region X.